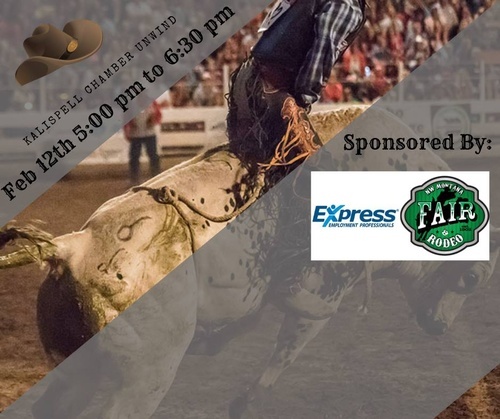 Come to February's Kalispell Chamber UNWIND with Express Employment and the Flathead Country Fairgrounds in a Rodeo themed event! Dress to impress in your best western attire and be ready to walk the catwalk to be judged for best dressed with the winner claiming TWO tickets to the Thursday night Rodeo the week of the 2019 NW Montana Fair! -Along with many other special guests! Enjoy appetizers from Chick-Fil-A, non-alcoholic beverages from Pepsi and adult beverages as well!